Do you enjoy taking pictures or have a collection of quality photos? If you do, you may be sitting on a stream of cash! Many people, businesses, websites, and blogs pay actual money for images and photos, which they purchase online. With the help of the websites below you can hop on this money train and sell photos online to generate a passive income stream. 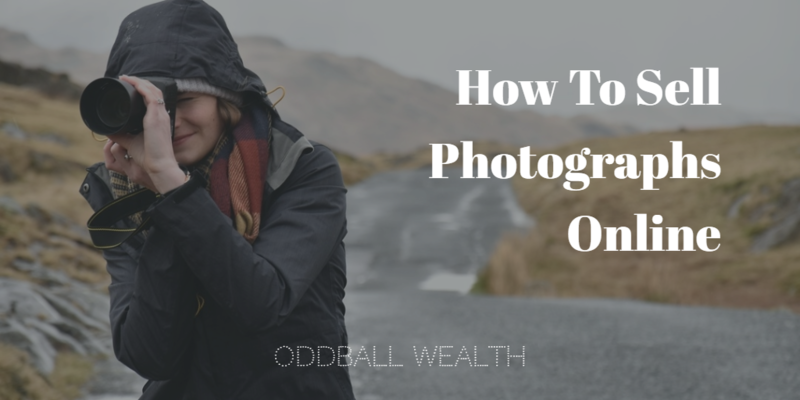 Even if your not a professional photographer, selling your images online is a excellent way to test the waters and start earning extra income on the side. If you are a professional photographer, then having multiple websites and platforms to sell your best pieces of work on will significantly help you make more sales and and earn more money online! All of the companies and websites below have been chosen for a variety of reasons, which include the amount of users and popularity of the site, having high royalty rates and payouts, and because they’re unique or have something different to offer. If you take good shots or have a database of quality images, then each website below, which allow you to sell photos online can give you additional revenue and a extra income stream. There are a couple good websites that I know of, which allow users to sell vector images and stock photos to individuals, businesses, and even other bloggers. The beauty of selling photos online is that they’re a good residual income source because your images can be sold over and over again! If you know of any other good photography websites to sell your photos on which are not listed below, please provide the name of the site by leaving a comment at the end of this post. Since the first release of the shutterstock platform, contributors have been paid more than $350 million! Their platform is easy to use and it’s simple to upload your images and sell photos online. Also, you keep all the copyrights of your images. The amount of money you make from selling your pictures depends on that images sale price, but you can earn up to 30 percent of the purchase price. Click here to learn more about Shutterstock. Fotolia has a very large customer base, more than 4 million to be precise. The website is owned by Adobe and will pay you a royalty anywhere from 20% to 46% per sale. What’s really nice about this site is that there’s no pay out threshold or holding period, so any royalties you receive are paid out immediately. This is an amazing place to sell photos online! Fotolia has been in business for over a decade and has more than 64 million images of their site. They’ve also integrated the use of popular software to be used with their platform, like Illustrator, InDesign, Photoshop, and other Adobe programs. Click here to learn more about Fotolia. Alamy pays a high royalty rate to it’s contributors of 50 percent! Which clears up the reason for why they have world’s largest collection of stock photos, with over 90 million high quality photos and videos available on their site. With a large amount of traffic visiting the website daily, you’ll be able to get your photography in front of millions of potential customers using Alamy. Learn more by clicking here. If your new to photography or selling images online then iStock Photo is a good platform to start on. They offer users many educational resources and other types of support, like forums which help newbies get a better grasp on things. Depending on the demand and popularity of your photos, you’ll earn a royalty for each transaction anywhere from 15% to 45%. iStock Photo customers can get things called “subscription credits” which can be used to buy photos, and when “credits” are used to make a purchase, you’ll only earn a 15% royalty regardless. You can increase the royalty rates which iStock pays you by agreeing to only sell your images on their website, in which case your royalties will range from 22% to 45%. You can always end the agreement by giving them a thirty-day notice. Learn more about iStock Photos here. DreamsTime has over 16 million users and almost 50 million stock photos on their website. Anyone can join this site and start selling their photos. All you need to do is sign up for an account and upload your media files. You’ll earn 25% to 50% revenue share for each image. Contributors who have high performing photos will get a 10% bonus and earn a 60% revenue share! You’ll also receive $0.20 bonus for each approved photo or image you upload on the first hundred that get approved. You’ll receive a bonus of $0.10 for each approved photo after the first one-hundred. Join or learn more about DreamTime by clicking here! This is a great site for selling photographs and illustrations. They offer flexible payment options and simple easy-to-follow terms. For these reasons, DepositPhotos is a convenient and profitable resource for anyone who works with images or creates visual content. Learn more about DepositPhotos here. Their award winning software allows users to create their own professional looking web photo albums. People are then able to display and sell their work using their platform and sell photos online. Learn more about jAlbum here. Zenfolio – An excellent website which allows both beginner and professional photographers a nice way to organize, display, and sell images online! Gallery Direct – Another wonderful website to display your images. Picture It On Canvas – This site allows lets you place your photos and images on gifts and products. Products you can place your photographs on include gallery-wrapped canvas prints, metal prints, photos on slate, pillows, blankets, jewelry, and many others. PhotoShelter – A nice e-commerce platform that allows you to sell photos online on just about any website. PhotoMoolah – This website offers a unique way to sell photos online. You can also enter your photographs into contests and get paid cash if your picture is picked as a winner. SmugMug – A nice platform that allows you to easily organize and create a storefront to sell your images and photographs online. Can Stock Photo – This is a nice place to upload and sell your photos online. You’ll also be able to make a considerable amount of money by earning royalties up to 50 percent. 123RF – Depending on how active you are and how many photos you contribute, this site pays its users royalties anywhere from 30% to 60%. In other words, the more images you upload to sell, the more money you’ll earn on sales. FineArtAmerica – A great site to show off photography portfolios and sell individuals photographs! Snapped4U – If you take pictures at weddings, parties, festivals, or other fun events then this site makes selling your photos very easy! Just upload your images and Snapped4U does the rest of the work. It’s also a great place to raise money by using the sale proceeds for special events or charities! There are also many great websites and companies that allow users to design and print photos onto a variety of tangible products, everything from t-shirts to coffee mugs! Once you create an account on Shutterfly, you’re able to upload all of your images or photos. Then you can make cool things like photo gifts, cards, and photo books. Plus, Shutterfly offers unlimited free storage for your pictures and images! Learn more here. CafePress offers many selling options to its users. You can set up your own website to sell your designs and products or set up your own shop directly on CafePress. Payments can be received by PayPal or by check. Learn more here. Zazzle is very similar to CafePress and is another great place to create and sell your designs and photos on products. Find out more here. Here are some other great places and websites for selling for photos and designs on physical products and goods. ⟵16+ Insane Apps That Will Save You Money Over and Over Again!